Traveling is so stressful, yet many people decide to do it constantly because the balance at the end of every trip is, most of the time, positive and rewarding. But, one of the ways that travelers tackle the uncertainty is asking and researching before every travel. For this reason, we want to share with you some of the common questions that we received from people around the globe when they want to come to Galapagos Islands. From where can I flight to the Galapagos Islands? You can flight to the islands even from Quito or Guayaquil. Now, there are currently three airlines that offer regular flights to Baltra (Santa Cruz Island) or San Cristobal Island, and they are Avianca, TAME, and LATAM. Can I go to Galapagos for 1 or 2 day´s trip? No, it´s not possible to take a day tour to Galapagos, because of flight connectivity. Flights in average land in Galapagos between 9:00 am – 1:30 pm and the latest return flight depart at 2:00 pm In the case of two days’ trip, the passenger will only be able to visit one of the ranch or breeding centers, and of course the hotel accommodation, but no more than that. For this reason, we recommend our customers, to stay in Galapagos at least 4 days and 3 nights. In this way, they can either take a short cruise, i.e. the Galapagos Seaman Journey, or do some daily excursions on a hotel based tour (Island Hopping). Can I change the itinerary followed by the cruise? No, you can´t. The Galapagos Islands is a National Park, and due to the number of vessels authorized to offer tourism services; For that reason, they have a tight scheduled to follow. Under those circumstances, they are authorized to be on a specific island on a specific day during specific hour´s frame. However, if the vessel changes its schedule, it has to be authorized by the National Park Authority, otherwise, you have to face a very expensive fine. Can I hire a local person as a guide once I arrive at the island? No, you can´t. In the archipelago, only certified guides are authorized to work as guides. Many of them are originally from the islands, which had studied and specialized as a naturalist guide, with at least English as a second language. However, many guides speak more than 3 languages, such as German, French or even Russian additional to Spanish and English. Are ATM´s available in Galapagos Islands? Can I withdraw money from them? Even in Puerto Ayora in Santa Cruz Island, and in San Cristobal Islands you can find some ATM´s that you can use. But, be aware that sometimes they don´t have a connection, and also international credit or debit cards sometimes cannot withdraw. We have been informed that the many UK and Australian cards cannot withdraw from the Galapagos Island ATM´s. Thus, we recommend to bring it. Can I drink tap water in the Galapagos Islands? Is it safe? No, you can´t. It is not safe. All the tap water in Santa Cruz, Isabela or Fernandina, for example, is only desalinated but not purified. As soon as you land there, the guide normally will recommend you to even brush your teeth with bottled. On the other hand, San Cristobal Island is only that has a drinking water treatment plant, yet is better to avoid it. Can I take a natural souvenir from the island? Can I smoke in the Galapagos Islands or the cruises? As a National Park, it is completely prohibited to smoke in the national park areas. Nevertheless, it is allowed only on the inhabitant areas of the archipelagos, like the town or the specified areas indicated in hotels, depending on their policies. Can I bring my own food to the islands? The archipelago has restrictions for bringing food to the islands. Avoid, any seed or fresh fruits. However, you can bring a limited amount of processed food such as cookies, candy bars, a limited amount of soft drinks, but everything will be checked through X-Rays and the personal of the Galapagos National Park Authority at the Airport in Quito or Guayaquil as well as your land to the island. Can I travel to Galapagos Islands with my pet (dog or cat)? No, you can´t. It is completely prohibited to introduce foreign animals from the continent because it will affect the fragile ecosystem of the archipelago. Nonetheless, you can find domestic pets in Galapagos that were introduced before the regulations, but nowadays these animals are registered and controlled by the owner and the national park authority. From where can I flight to Galapagos? You can flight to Galapagos either from Quito and from Guayaquil. The incoming flight has early departure hours from 6:00 up to past midday. On the returning flight the average is between 9:00am to 2:00 pm. You can fly with Avianca, TAME or Latam. Cruising or Land Tour? Which one is better? Of course, it depends on traveler needs and interest. 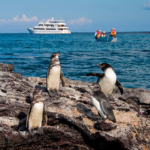 Cruising is better for those travelers wanting to optimized their time in Galapagos by visiting as much as they can, also willing to experience cruising along the archipelago, even though the navigation most of the time is at night. On the other hand, the Island Hopping option can fit the budget and schedule of travelers, as well as being 100% customized to their needs. Which type of vessel is better? Big or small yachts? The vessels in Galapagos are from 8 passengers to 90. Each one has their pros and cons, however, we believe that the experience of cruising could be enhanced onboard small yachts. The highlight of this type of cruises is that the service is more personal, paying attention to detail. Why do I have to leave so early from the boat when I´m departing from Puerto Ayora? The airport that serve Santa Cruz Island, is in Baltra, which is a small island close to Santa Cruz. To be able to reach the airport, we have to cross the Itabaca Channel in a small boat that takes approximately 10 minutes. However, from the channel to Puerto Ayora is approximately 45 minutes by car. These hours may vary if the hour is close to the flights, so the traffic increase and the services may suffer delays. Thus, if the returning flight is at 10:00am, people should be at the airport at least at 8:30am, but to be able to be at that hour passenger should be leaving the boat at 6:00am approx. Is there wifi available everywhere in Puerto Ayora and/or onboard the vessel? The internet connection on the islands is very slow. Even though many places do their best to offer WIFI, the truth is that most of the time the service shutdown, or doesn´t support high speed navigation or apps. Nonetheless, you will be able to receive a WhatsApp, or send an email, nor watching a YouTube video. What local food should I try in Galapagos Island? The Galapagos Island is famous by its lobster, and if you are traveling after mid-June you will be able to try it. For this reason, the restriction of consumption, commercialization and fishing of this crustacean is between January 16th to June 16th for this 2017. If you´re able, you can eat it grilled, or with special sauces like the coconut sauce called “Encocado”. Additional to lobster, you can try the local fish species called “Brujo” (Sorcerer), or a wide range of seafood and shellfish. Many of them are very fresh and prepared after your request, grilled, with garlic, spicy, or with coconut. Can I see endemic and rare animal species resting and walking everywhere in town? Yes, you definitely can see them. To point out, one of the highlight of the Galapagos Islands and their biodiversity is that animal are not afraid of humans. They are the owner of the enchanted island, so it is very common to see a sea lion resting or sleeping in one of the bench at the harbor in Puerto Ayora, or a marine iguana crossing the harbor. If you are going to visit Puerto Ayora, don´t forget to visit the fish market, where you can see the pelicans trying to steal their dinner. Can I touch this animals? Unfortunately, you can´t touch animals, chasing or feed them. The rules are very strict, and if they catch you doing that, you can face a punishment by the National Park Government. Following these rules, help the animals to continue its normal process of evolution without human interference.